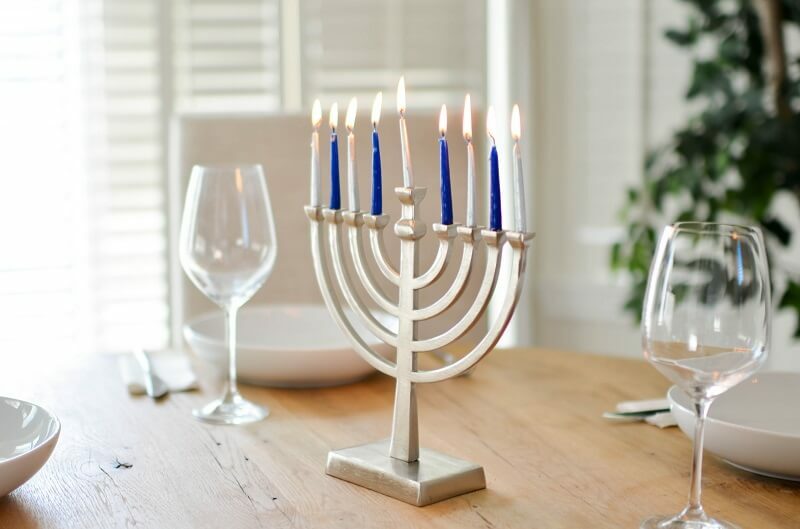 A Menorah is the perfect centerpiece for your new home during the Hanukkah season. It doesn’t have to be glitz and glam for Hanukkah, and neither does your new home. Keep it simple, incorporate some traditions, old and the new, and you’ll have your new home decorated for the holiday in no time! Cobalt blue is the signature color for Hanukkah, and honestly, it’s just a wonderful hue for your new home. If you don’t want to go as far as painting the walls this color permanently, you can decorate your home using this shade. Put up some blue curtains in your living and dining rooms, and line the dining room table with a blue and white tablecloth. Set the table with cobalt blue and white china plates and stemware. Light some white candles and you’re ready for your Hanukkah night dinners! Outside, decorate your home with bright blue and white lights. Drape the lights around your shrubs, trees and front door to brighten up your home. Even think about lining your driveway, roof, and mailbox. Every kid remembers spinning dreidels during the Hanukkah season. While you can buy your own, why not make a craft night out of it with your kids? Make your own dreidels, big and small, and paint them in variations of blue, white and silver. Afterwards, the kids can play with their new dreidels, and you can display the ones you made on the mantel or string them along the front hallway. Another do-it-yourself project for you and this kids are Hanukkah themed crackers. These crackers are an exciting centerpiece at the dinner table. To make them, you’ll want to insert a piece of gelt into the cracker and wrap them tight. Then at dinner, someone grabs one end of a cracker and hands the other end to the person next to them. Everyone pulls and the crackers will open with a pop of the firecracker inside! Decorating doesn’t need to be fancy for Hanukkah. And the holidays shouldn’t be a time to stress, especially after closing on a new home. Most importantly, make the most of the new home during this time of the year, and spend it with the ones you love.